Our range of products include tretinoin microsphere gel, hydroquinone tretinoin and mometasone cream, miconazole cream, hydroquinone,tretinoin and hydrocortisone cream, betamethasone and gentamycin cream and white soft paraffin and liquid paraffin cream. We are leading exporter and manufacturer of tretinoin microsphere Gel. Tretinoin microsphere Gel exporter in India. We are leading exporter and manufacturer of Hydroquinone,Tretinoin And Mometasone Cream. Hydroquinone,Tretinoin And Mometasone Cream exporter in India. We are leading exporter and manufacturer of Miconazole cream. Miconazole cream exporter in India. We are leading exporter and manufacturer of Hydroquinone,Tretinoin And Hydrocortisone Cream. 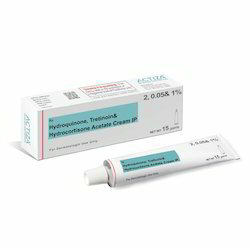 Hydroquinone,Tretinoin And Hydrocortisone Cream exporter in India. We are leading exporter and manufacturer of Betamethasone And Gentamycin Cream. Betamethasone And Gentamycin Cream exporter, manufacturer, supplier in India. We are leading exporter and manufacturer of White soft paraffin And Liquid Paraffin Cream. White soft paraffin And Liquid Paraffin Cream exporter in India. We are leading exporter and manufacturer of Fluconazole Cream. Fluconazole Cream exporter in India. We are leading exporter and manufacturer of Adapalene Gel. Adapalene works by slowing the production of certain natural substances that can cause acne. Adapalene Gel exporter in India. We are leading exporter and manufacturer of Tacrolimus Cream. We are leading exporter and manufacturer of Benzoyl Peroxide Cream. Benzoyl Peroxide Cream exporter in India. We are leading exporter and manufacturer of Triamcinolone Acetonide Cream. Triamcinolone Acetonide Cream exporter, manufacturer, supplier in India. We are leading exporter and manufacturer of Ciprofloxacin Cream. Ciprofloxacin Cream exporter in India. Looking for Skin Ointment ?